Almost all spray-can paints will not resist spilled gasoline very well. Some are better than others, but all pale in comparison to factory paint. Almost all spray-can paints will leave a finish that is soft compared to factory paint. This is a problem because dust will get embedded into the finish, and the surface will lose its shine. Getting a good-looking paint job at home with spray paints is not difficult, but the paint job will not last as many years as a factory paint job. I briefly explored the possibility of spraying two-part (2-K) urethane paint which is what most car and motorcycle manufacturers use. There were two options: 1. 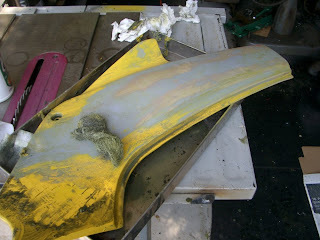 Mix the paint myself and shoot it using an air sprayer (eg an HVLP gun). 2. Get SprayMax 2K in a can: http://www.repaintsupply.com/pd_2_part_2k_aerosol.cfm I've heard good things about this paint, but it's very expensive. I would need at least three cans, and for a just a little more money, I could buy a quart of real 2K paint and a cheap HVLP gun from Harbor freight. In the end, I decided to just use Krylon spray cans for $2.99 each. 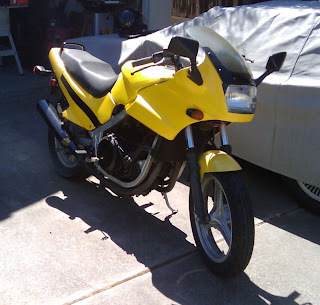 The motorcycle itself is not the most beautiful machine in the world, and repainting it every 5 years is an acceptable level of maintenance. 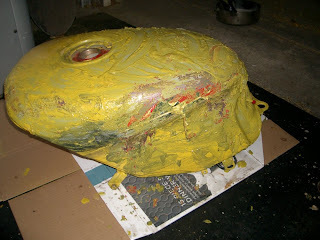 The original color was red, and I painted yellow over it without stripping last time. 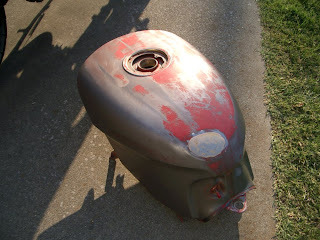 I used Jasco methylene chloride stripper on the steel gas tank. I've shot a few coats of Krylon primer, and used some glazing putty to fill in the last surface imperfections. I wet sanded the primer with 320 grit between coats. 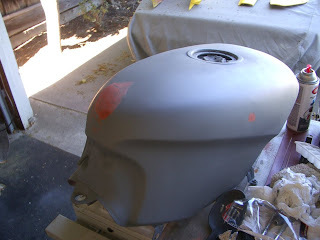 This was the only sanding that I did on the gas tank. 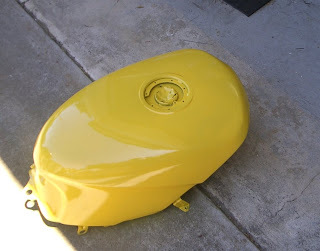 I shot about 3 coats of color on the tank, letting each coat dry for a day. Krylon can be re-coated within an hour or after 24 hours. These directions must be followed or the paint will lift and look terrible. It will have to be re-sanded and painted again. I was shooting pretty heavy coats, and I wanted to make sure everything was set before I loaded on more paint. 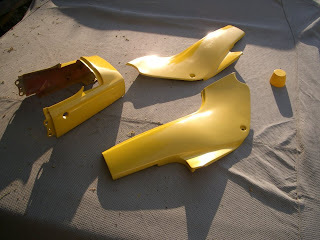 The plastic fairings on the bike have another problem: The methylene chloride stripper will dissolve the plastic fairing as well as the paint on it! I learned this the hard way the first time I painted the bike. A good alternative is to use regular DOT3 brake fluid on the plastic parts. It doesn't work nearly as well as paint stripper, but it's a lot better than nothing, and it doesn't attack the fairing plastic. Use really coarse steel wool to scrape off the old paint. I sanded starting with 80 grit, and worked up to 320. I did not use primer on the plastic parts -- just shot color right on the plastic. I shot three heavy coats of color over the course of three days. After drying another day, I added black stripes. 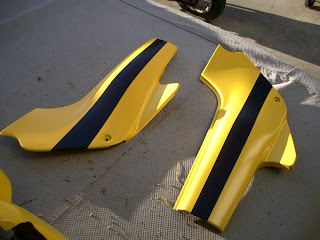 The stripes were masked with blue 3M painter's tape, and the black paint went right over the yellow. I did not use a clear coat over the color coats. 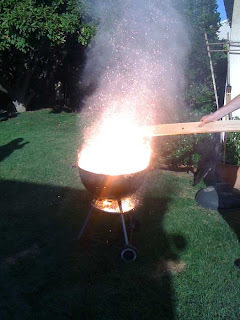 After watching the famous liquid oxygen BBQ lighting video on the internet, I knew it was time for me to try it myself. In this video, I am pouring 1.5 liters of liquid oxygen on a bunch of smoldering charcoal briquettes. The oxygen rapidly turns to gas and accelerates the rate of combustion at the surface of the briquettes. Some of the charcoal fractures and shoots off tiny pieces that burn with a bright light. I made the liquid oxygen by passing gaseous oxygen through a copper tube that was submerged in liquid nitrogen. The liquid nitrogen is colder than the boiling point of oxygen, so it causes the oxygen to condense and be ejected as a liquid from the other end of the tube. Liquid nitrogen can be bought at welding supply stores, however I made a batch myself with a cryocooler. 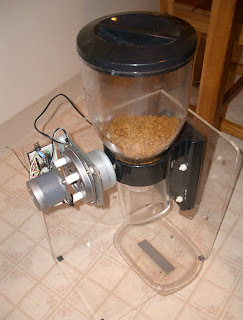 I recently set up my automatic cat feeder (http://benkrasnow.blogspot.com/2009/02/automatic-cat-feeder.html) for a long-weekend vacation. This was probably the sixth time that I have used the feeder with great results each time. I also setup a motion-activated webcam that posted frame captures to a web server so that I could see the feeder (and cat) while I was away. One day during the trip, I checked the web server and noticed the feeder had dispensed a huge amount of food. I've never seen my cat eat his fill and walk away from a dish with food in it, but he did this time so there much have been a truly massive amount. 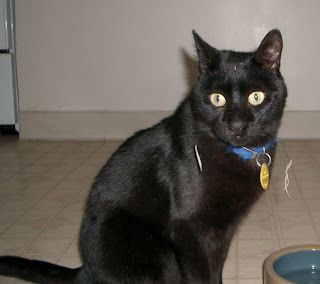 When I returned home, I saw what had happened: The cat had knocked over the darkroom enlarger timer, and by strange chance, the timer knob was turned from 3 seconds (an interval that dispenses a single-serving of food) to 20 seconds! The feeder emptied the entire storage chamber of food into the serving dish. It's not possible the cat knew what he was doing by messing with the darkroom timer, but it's also very strange that this happened by mere chance. I never liked the timer approach to the cat feeder because it assumes the motor turns at a constant speed, and the darkroom timer is not easy to adjust accurately in the range of 2-4 seconds. I thought about adding a shaft encoder to make the system closed-loop. I also thought about using a mechanical means to control the shaft (ie a Geneva Wheel). Finally, I decided to use a strong stepper motor in open-loop control. I also wanted to keep the same gear reduction box that was originally coupled to the food dispenser. It's torque amplification is helpful, and it has also become a structural part of the feeder, so not easy to change. 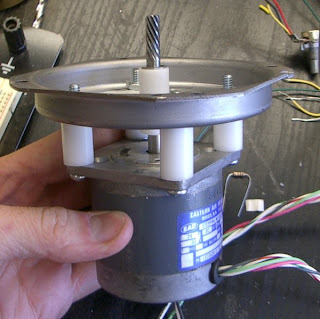 I removed the old DC motor and pulled the armature off the shaft. I cut the shaft, then built a press-fit delrin coupler to mate the stepper motor shaft to the remaining piece of original shaft (with an integral helical gear on the end). I then made some spacers out of delrin and mounted the motor to the gearbox. I used an Atmel AT-Mega8 AVR to turn the stepper motor through four shaft rotations when power is applied. I used PN2222 transistors to switch the unipolar motor windings. The transistors are driven through resistors by half the D port in the AVR. The gear reducer's output will spin about 1/6 of a turn, which will advance the "butterfly valve" in the feeder enough to dispense a single serving. I coded the Atmel chip using Atmel's IDE in C with WinAVR. I used PonyProg to download the code into the chip via a simple parllel port interface. I would normally use an Arduino or similar microcontroller for projects like this, but this one is so simple, a full-fledge microcontroller would be overkill and too expensive. The AT-Mega8 is about $6 and needs a $1 crystal. The Arduino is around $30. My cat stuck his head into a pile of plastic shavings the garage and managed to get a couple scraps stuck in his whiskers.